A gunman opened fire on members of Congress practicing for the Congressional Baseball Game in Alexandria, Virginia, Wednesday morning. Rep. Steve Scalise (R-LA), the House Majority Whip, and several aides were wounded in the shooting. Rep. Mo Brooks (R-Ala.), who was also practicing for the game at the Alexandria baseball field, recounted the shooting in interviews afterward. Brooks was on deck for batting practice, he told CNN, when he heard rifle shots and then Scalise&apos;s scream. Brooks later told reporters he then hid with "two or three others" behind the plastic of the batting cage and ran to the first base dugout during a break in the gunfire. He and another congressman used Brooks&apos; belt as a tourniquet to slow the bleeding of a wounded aide, Brooks told CNN. Two of the representatives&apos; security detail then returned fire on the shooter; both were shot, according to Brooks&apos; account. After the shooter was taken down Brooks said, he ran to Scalise — who was near second base when he was shot, and had crawled into the outfield with "a trail of blood." Brooks said he gave Scalise fluids and applied pressure to the hip wound while Rep. Brad Wenstrup (R-Ohio), a physician, "started doing what you need to do to minimize the blood loss." A helicopter then began evacuating the wounded. Scalise was elected to the House of Representatives in a 2008 special election to fill the seat of Republican Bobby Jindal, who was elected governor of Louisiana in 2007. He had previously served in the Louisiana State Senate and State House and was named the Republican Whip in 2014. He won re-election in 2016. Scalise is known as a conservative member of Congress and has a wife and two children. 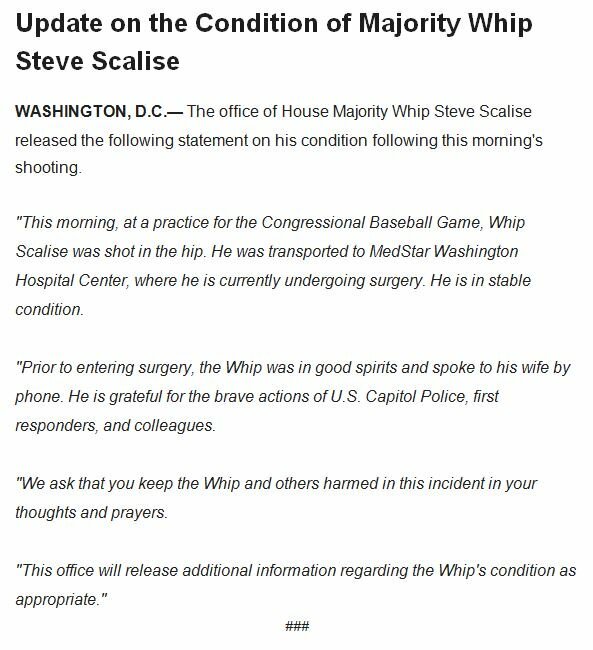 He is in stable condition, Scalise&apos;s office said in a statement. Who is Rep. Mo Brooks? Brooks served as a state representative, a district attorney and a special assistant attorney general in Alabama before being elected to the United States House of Representatives in 2010. He served as an at-large Alabama delegate at the 2016 Republican National Convention, where he was bound to support Sen. Ted Cruz (R-Texas). In May, Brooks announced plans to run for Senate in Alabama&apos;s 2017 special election. He is one of several candidates running for Attorney General Jeff Sessions&apos; vacated seat, which has been occupied by Sen. Luther Strange since February. The shooter was reportedly in custody Wednesday morning. Two people are reportedly in critical condition at George Washington University Hospital, but their identities have not be disclosed. "You have a baseball bat, they have a rifle," Brooks said. "You&apos;re defenseless." Will Drabold contributed to this report.